A space to retreat from 'the desperate field of battle'. To connect with likeminded others. To find a tribe, a community, a sense of belonging. To gather, together, in devotion to creative practice. Casual Open Studio Journaling Sessions! Seeking to reignite or keep a fire under your creative practice and / or develop your creativity. Feel lost in your art and need some inspiration. Struggle with consistency, the critic, overwhelm. Just wanting to get messy, make marks and have fun. Find creative community, connection and a regular artist date. Yearning to explore and express your creativity more. Join us every Wednesday, for a weekly gathering of friendly and supportive creative souls, committed to intentional, regular practice. We bring our journals, supplies and selves and journal while we chat, share inspiration and resources. These are casual, non instructional, non directive sessions. It is simply a hosting of time and space for you to connect and explore your creativity, alongside others, freely and at your own pace. Though a natural by product of keeping creative company, is that we learn by osmosis. There is however, a rich and diverse selection of mixed media journaling books and magazines to browse, plus lots of other resources and prompts in studio, to inspire you. 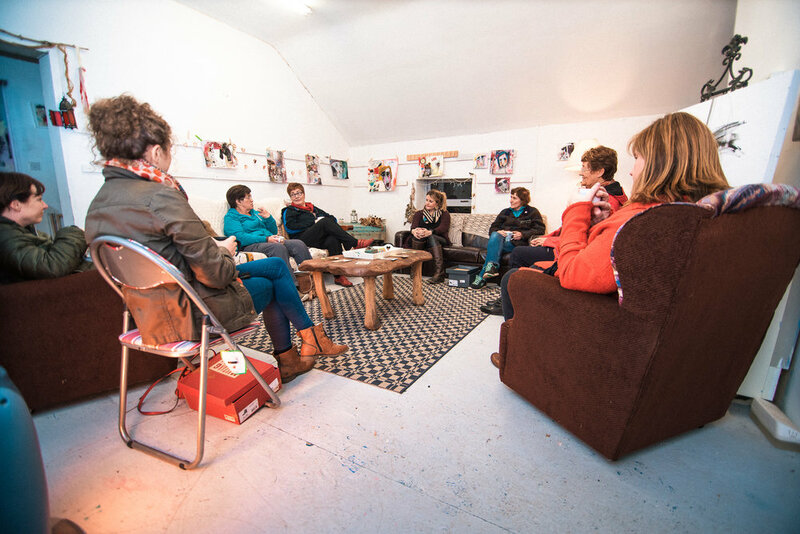 There is a selection of tea and coffee, chill out area and a cafe on site if you fancy lunch after. We also anticipate organising occasional creative field trips, to broaden our experience. Call / text Amanda to let us know to expect you or if you have any questions or simply fill in the form below. PILGRIM SOUL STUDIO IS ALSO AVAILABLE TO RENT FOR CLASSES AND WORKSHOPS. ENQUIRE USING ABOVE FORM. SPACE IS COMPOSED OF A INTIMATE CHILL OUT AREA AND ADJOINING ART ROOM. 6 X 6FT FOLDING CRAFT TABLES + CHAIRS. FREE PARKING + CAFE ON SITE. When I came across these words by WB Yeats, I was blown away. Ever since I can remember, I have sought refuge from the world. I grew up in the countryside. Hay barns, fields, farms and forestry were the canvas on which to express ourselves and we did. We created little worlds of our own, we tended to them. We belonged. It was our place of retreat, the fortress of our becoming. It was our Avalon. I think I have always yearned for that again. A world to which I could devote myself...to be free again, to be me again. Because we never stop becoming, do we? We equate 'growing up' with becoming an adult and that once we reach adulthood, there's no more becoming. There's no one else I could be. This is it. This is me. We settle. But it's not about growing up.. it's about growing out. Embodying as much of ourselves as we can. To me, this means to engage and connect the creative self. To sit in creative circles that keep alive in you, your hope, your joy, your spirit. To animate in you the person you already know you are, want to be, or are becoming. Creative practice is a devotion and needs it's own space. Pilgrim Soul is that space. Join me, far from the madding crowd, in honour of hope and to nurture the memories of who we are, through creative self and soul nourishing activities. Rathcormac Craft Village, Co Sligo. In the shadow of the majestic Ben Bulben. A half mile from the resting place of WB Yeats. The Creative Spirit lives in all of us. We just need a space to find it again. Subscribe to Postcards From Deck: Weekly Newsletter, delivered on Sundays, including all the news, updates, events and announcements.